On September 18th, the Syrian Arab Army (SAA) and the Syrian Republcian Guard (SRG) officially crossed the Euphrates River using a pontoon bridge and amphibious vehicles. They then engaged ISIS terrorists on the eastern bank. The SAA and the SRG advanced on ISIS positions in the Saqr Island and captured a major part of it, liberated the village of Sabha, and entered the villages of Marrat and Mazlum. ISIS counter-attacked against government forces in both areas with the support of 3 VBIEDs but failed to stop the government advance. According to the ISIS-linked news agency Amaq, about 40 SAA troops were killed in the clashes there. On the northeastern flank of Deir Ezzor city, government forces liberated Hawi, Zughayr, Hamad, and Shumaytah villages and entered the nearby oil wells area. 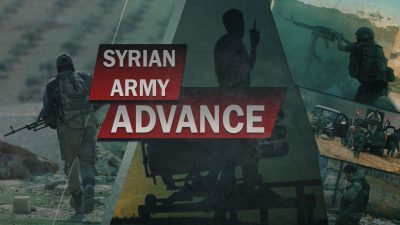 On September 19th, the SAA and the SRG continued developing their advance on the eastern bank in order to liberate Khasham Fooganni, al Abd, at Tabiyah, Albu Muayt, and the al-Tabiyah oil field and to build a buffer zone near the SDF-held area. Meanwhile, Russian-US negotiations continued behind the scene as the sides were attempting to reach an agreement dividing spheres of responsibility in combating ISIS in eastern Syria. The SDF, supported by the US-led coalition, has advanced against ISIS in Ramilah, Tishrin, Al-Amin, and the Al-Hani neighborhoods of Raqqah city and captured a notable part of Ramilah and Tishrin. Since the start of the operation in the city, the SDF has realized major progress and is now pushing towards a final stage of the operation.